Erin: Even though early Jewish cartoonists wrote white-bread characters, the Jewish mythos is still there. Just look at Superman. The destruction of his home planet parallels the destruction of the Temple in Jerusalem in 70 AD. He was forced from his homeland, and separated from the house of his parents (i.e. God the Father). Since then he’s been living under a foreign culture. He mingles with the ordinary people, and likes them, but he’s not quite of them. He’s special. He’s protected, in a way that others aren’t. And when disaster strikes, he knows that ultimately, he’ll be all right. 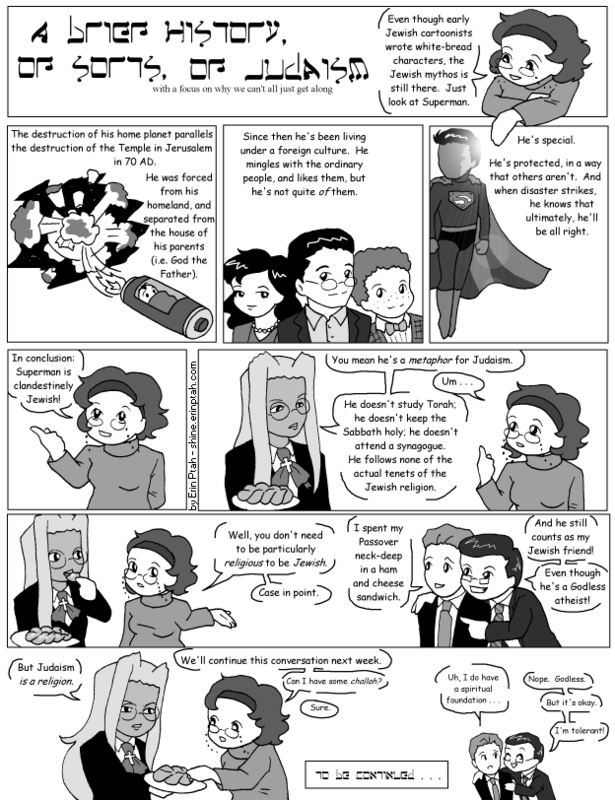 In conclusion: Superman is clandestinely Jewish! Integra: You mean he’s a metaphor for Judaism. Integra: He doesn’t study Torah; he doesn’t keep the Sabbath holy; he doesn’t attend a synagogue. He follows none of the actual tenets of the Jewish religion. Erin: Well, you don’t need to be particularly religious to be Jewish. Case in point. Jon: I spent my Passover neck-deep in a ham and cheese sandwich. Stephen: And he still counts as my Jewish friend! Even though he’s a Godless atheist! Integra: But Judaism is a religion. Erin: We’ll continue this conversation next week. Can I have some challah? Stephen: Nope. Godless. But it’s okay. I’m tolerant!